Greater Boston is the area of the Commonwealth of Massachusetts surrounding the city of Boston, consisting most of the eastern third of Massachusetts, excluding the South Coast, Cape Cod & The Islands. The area can be characterized as the metropolitan statistical area (MSA) or the combined statistical area (CSA), the latter which includes the metro areas of Manchester, New Hampshire; Providence, Rhode Island and Worcester, Massachusetts. By contrast, Metro Boston is usually reserved to signify the "inner core" surrounding the City of Boston, while "Greater Boston" usually at least overlaps the North and South Shores, as well as MetroWest and the Merrimack Valley. Greater Boston is tenth in population among U.S. metropolitan statistical areas in the United States, home to 4,684,299 people as of the 2013 U.S. Census and is ranked sixth among CSAs, having 8,041,303 people. Greater Boston has many sites and people significant to American history and culture, particularly the American Revolution, civil rights, literature, and politics, and is one of the nation's centers of education, finance, industry, and tourism, with the sixth-largest Gross metropolitan product in the country and twelfth-largest in the world. Light Blue represents the area in Massachusetts known as Greater Boston, while Dark Blue represents the Metro-Boston area and Red represents the City of Boston. The most restrictive definition of the Greater Boston area is the region administered by the Metropolitan Area Planning Council (MAPC). The MAPC is a regional planning organization created by the Massachusetts legislature to oversee transportation infrastructure and economic development concerns in the Boston area. The MAPC includes 101 cities and towns that are grouped into eight subregions. These include most of the area within the region's outer circumferential highway, I-495. The population of the MAPC district is 3,066,394 (as of 2000), in an area of 1,422 square miles (3,680 km2), of which 39% is forested and an additional 11% is water, wetland, or other open space. Notably excluded from the MAPC and its partner planning body, the Boston Region Metropolitan Planning Organization, are the Merrimack Valley cities of Lowell, Lawrence, and Haverhill, much of Plymouth County, and all of Bristol County; these areas have their own regional planning bodies. Northern Bristol County is part of Greater Boston, even though it is part of the Providence MSA. 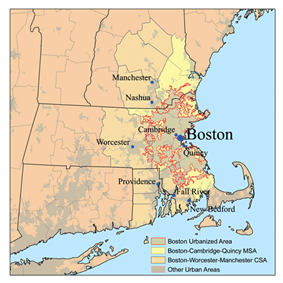 The urbanized area surrounding Boston serves as the core of a definition used by the U.S. Census Bureau known as the New England city and town area (NECTA). The set of towns containing the core urbanized area plus surrounding towns with strong social and economic ties to the core area is defined as the Boston-Cambridge-Nashua, MA-NH Metropolitan NECTA. The Boston NECTA is further subdivided into several NECTA divisions, which are listed below. The Boston, Framingham, and Peabody NECTA divisions together correspond roughly to the MAPC area. The total population of the Boston NECTA was 4,540,941 (as of 2000). An alternative definition defined by the United States Office of Management and Budget, using counties as building blocks instead of towns, is the Boston-Cambridge-Newton, MA-NH Metropolitan Statistical Area, which is further subdivided into four metropolitan divisions. The metropolitan statistical area has a total population of approximately 4,640,802 and is the tenth-largest in the United States. The components of the metropolitan area with their estimated 2012 populations are listed below. The 40 most diverse Census tracts in the Boston CSA. The top 40 census tracts in the Boston CSA with the highest percentage of residents who identify as Hispanic or Latino. Census tracts in the Boston CSA with the highest percentage of residents who identify as Black American. Census tracts in the Boston CSA with the highest percentage of residents who identify as Asian American. Census tracts in the Boston CSA with the highest percentage of residents who identify as Irish American. Census tracts in the Boston CSA with the highest percentage of residents who identify as Italian American. Census tracts in the Boston CSA with the highest percentage of residents who identify as Portuguese American. Census tracts in the Boston CSA with French or French Canadian listed as first ancestry. The City of Boston also has one of the largest LGBT populations per capita. It ranks fifth of all major cities in the country (behind San Francisco, and slightly behind Seattle, Atlanta, and Minneapolis respectively), with 12.3% of the city recognizing themselves as gay, lesbian, or bisexual. A long time center of higher education, the area includes many community colleges, two-year schools, and internationally prominent undergraduate and graduate institutions. The graduate schools include highly regarded schools of law, medicine, business, technology, international relations, public health, education, and religion. Thomas P. O'Neill Jr. Tunnel, carrying I-93 and Routes 1 and 3 concurrently. Zakim Bunker Hill Bridge, carrying Interstate 93, Route 1 and Route 3 concurrently. Fore River Bridge, carrying Massachusetts Route 3A concurrently. Logan International Airport in Boston, 3 miles (4.8 km) northeast of downtown Boston, New England's largest transportation center. The Salem Ferry, 92 ft. Catamaran is photographed approaching its dock off Blaney Street at the Salem Maritime National Historic Site in Salem, Massachusetts, USA. ^ "Transportation Plan – Overview". Boston Region Metropolitan Planning Organization. 2009. Retrieved 2009-09-27. ^ a b "New England City and Town Areas and Principal Cities". U.S. Census Bureau. November 2008. Retrieved September 14, 2009. ^ "Standards for Defining Metropolitan and Micropolitan Statistical Areas". Office of Management and Budget. December 27, 2000. Retrieved September 14, 2009. ^ "City and Town Population for 2013". U.S. Census Bureau. Retrieved September 19, 2014. ^ "Mapping the 2010 U.S. Census". U.S. Census Bureau. ^ "2009 Globe 100 – Top Massachusetts-based employers – The Boston Globe". The Boston Globe. 2010-01-19. ^ "Top Companies in Massachusetts on the Inc. 5000"
^ "12.9% in Seattle are gay or bisexual, second only to S.F., study says". The Seattle Times (The Seattle Times Company). 2006. Retrieved 2009-05-01. Wilson, Susan (2005). The Literary Trail of Greater Boston: A Tour of Sites in Boston, Cambridge, and Concord, Revised Edition. Commonwealth Editions. An informative guidebook, with facts and data about literary figures, publishers, bookstores, libraries, and other historic sites on the newly designated Literary Trail of Greater Boston. Warner, Sam, Jr. (2001). Greater Boston: Adapting Regional Traditions to the Present. University of Pennsylvania Press.